The Single Blade range from Proraso is a selection of shaving products specially created for those wet shavers who enjoy the benefits of safety razor and or cut throat razor shaving. In this twin pack we have paired up their incredible Wood & Spice fragranced Cologne and matching Aftershave Balm. This way not only will your shaved skin be moisturised and soothed you will smell good too. Specially formulated by Proraso, this balm will help to nourish, moisturise and revitalise your skin after shaving. Bold and velvety primary notes go hand in hand with delicate notes of cumin and saffron. Sophisticated cedarwood and guaiacum combine with soft amber notes and a gentle hint of vanilla at the end. Proraso Wood and Spice Cologne is scented with notes of wood and amber expertly blended with Cedarwood, zesty citrus and spices to create a memorable, manly fragrance. The inclusion of vanilla leaves you feeling relaxed and refreshed. This is a spray-on cologne so there is no waste when applied. This cologne is a hit with men of all ages and it can be worn during the day and in the evenings. Both are presented in Proraso branded presentation boxes. Aftershave Balm: Massage a small amount of balm into freshly shaved skin to refresh, moisturise and revitalise your skin. Cologne: Apply to pulse points and around the neck and shoulders. Don’t apply directly to freshly shaved skin. 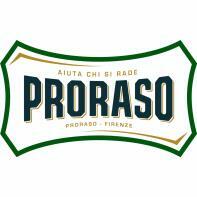 Proraso shaving products are enjoyed around the world by men of all ages. This twin pack of cologne and aftershave balm is the perfect partnership for looking after your skin after shaving and if you want to smell good a skoosh of cologne is what's needed. Based on natural ingredients, paraben-free, no silicones, no SLS, no mineral oils or artificial colourings.